Seattle Public Utilities is taking a new and experimental approach to improving the health of Seattle’s biggest urban stream. Swift and green, the Cedar River is alive, both on the surface and below. A little-known wilderness teems just out of sight, in the river below the river — the saturated soils, gravel sand and rocks under and along the river’s main channel. This is the so-called hyporheic zone: a realm where functions vital to the overall health of a stream and even the watershed take place. And it’s from there in the healthy Cedar that Seattle’s Thornton Creek might get new life. Waters above and below ground constantly exchange, flowing into and out of one another, circulating oxygen, removing wastes and moderating temperatures in the main channel, cooling the water in summer and warming it in the winter. A menagerie of tiny creatures live there, too, many invisible to the naked eye, but performing herculean tasks. Tiny invertebrates shred leaf litter, cycling nutrients from the land to the water. Microbes on the surface of the rocks and gravel provide free water treatment, consuming the nutrients in fertilizer runoff, and even breaking down hydrocarbons from oil pollution, making the hyporheic a kind of liver for the river. The food web starts here, too, in those shredders and grazers working the detritus from the rain of bugs and leaves from nearby trees, and in the biofilm that microbes build on rocks. They in turn are food for bigger bugs, living between rocks and particles of sand, that then feed fish and birds. The land, surface waters and in-stream and subsurface flows all are connected. So as Seattle Public Utilities (SPU) works to restore Thornton Creek, the city’s largest urban stream, a new idea has been in the works: Why not start at the bottom, and — with a little help from the healthy Cedar River — reassemble and reconnect all the pieces of the watershed, and see what happens? The creek’s 15-mile main stem empties into Lake Washington, flowing through an 11.4-square-mile watershed between Interstate 5 and Lake City Way. With more than 70,000 people living in the watershed, it is Seattle’s most urbanized. Salmon struggle here, often dying before they can spawn. 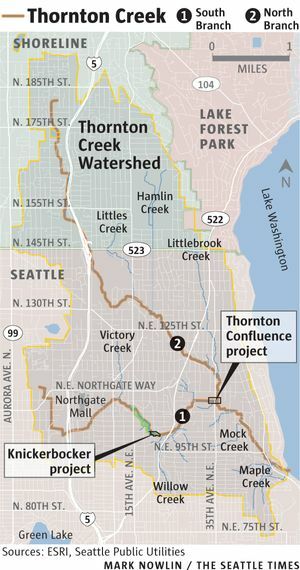 After decades of development, Thornton Creek had no healthy base to start from. Because of dredging and channelizing, the creek in some cases altogether lacked the gravels and other benthic layers beneath and along the channel. So the city two years ago launched an $11 million experimental restoration in two reaches of Thornton Creek, rebuilding a total of 1,600 feet of the channel from the ground up. 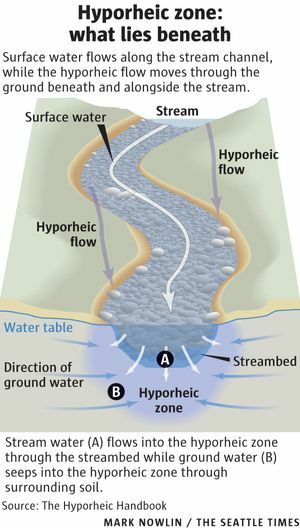 The idea was to see if a constructed hyporheic zone can provide localized water-quality treatment in an urban stream. SPU rebuilt two stretches of streambed, the Kingfisher Natural Area and Thornton Confluence. It was a total makeover: Workers realigned the channel, tore out the fill from development and put the creek back in its flood plain. They brought in gravel, built plunge pools and log jams, and planted trees and shrubs along the banks. 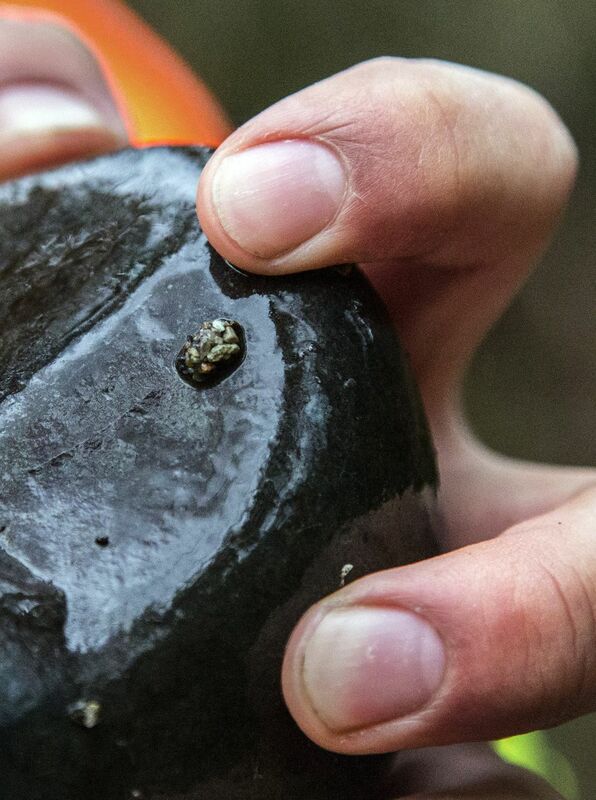 Then last year SPU sent Morley and other scientists to gather rocks from beneath the stream bottom in tributaries of the Cedar River, which are in a largely pristine state. The task was to inoculate Thornton Creek with material from the hyporheic zone in the Cedar tributaries, to jump start a healthier system. In December, Anne Baxter, a research biologist at NOAA fisheries working with Morley on the project, was reaching into the cold current of the Cedar to uproot baskets of rocks. “That’s a good sign of life,” she said, finding her footing on slippery rocks. Re-creating that natural purification system is a novel restoration approach, said Katherine Lynch, urban creeks biologist at Seattle Public Utilities, as she helped dig out the sample basket, stuck fast in the riverbed. The rocks Baxter gathered last month were headed not to Thornton Creek, but back to the lab at the Northwest Fisheries Science Center. At the lab, scientists scrubbed biofilm off rocks with a toothbrush, decanted the murky water full of scrubbed-off film into a flask, then strained it to remove the material collected for DNA analysis. The goal is to create a baseline from which to judge what is present in a healthy stream, compared with what’s in Thornton, and to test the results of inoculation on the urban creek. The team looks at everything: temperature, dissolved oxygen, macroinvertebrates living between the spaces of rocks and sand particles, and the census and productivity of bacterial communities in the biofilm on the rocks. 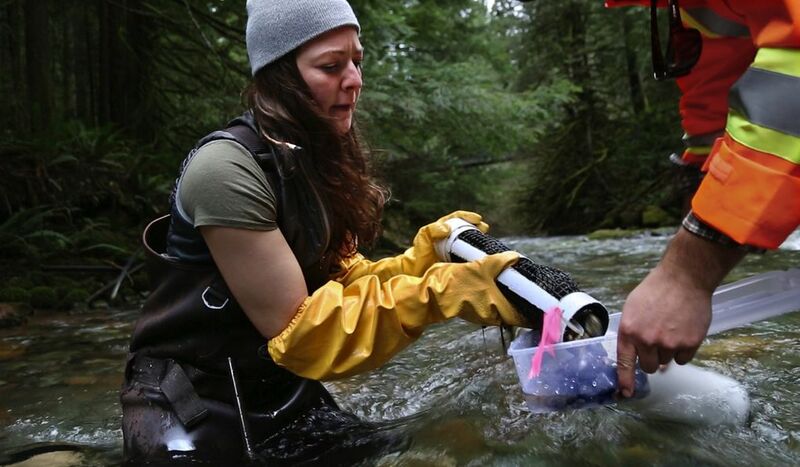 So far Baxter’s colleague, microbiologist Linda Rhodes, has detected an uptick in the activity level of microbes in samples taken from treated reaches in Thornton Creek, an encouraging sign. If it’s successful, SPU may expand its restoration method to other stretches of urban streams, starting with Taylor Creek near the south end of Lake Washington in Southeast Seattle. Paul Bakke, a geomorphologist at the U.S. Fish and Wildlife Service, is rooting for Thornton Creek. He grew up nearby, back when parents were so worried about the pollution it carried they called it “Polio Creek.” But that didn’t keep him away. He still comes back today, a collaborator on the project he helped shape from the beginning. “Usually we don’t pay much attention to the streambed, we don’t do anything to bring it back to life,” Bakke said.